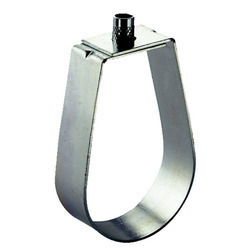 Sprinkler Clamp is used for Hanging System in Plumbing , Fire and AC Ducting. Reckoned amid one of the credible market names, we are willingly betrothed in offering to our patrons Sprinkler Clamp. - One piece clip guarantees a high permissible load. Offered by us is a range of Sprinkler Clamp that finds application in water lines, drainage lines, firefighting lines and sprinkler lines of all types of pipe materials like PVC, cast iron, galvanized iron, copper and stainless steel. Further, these precision engineered components are manufactured as per the industrial standards and are offered at reasonable prices. Sprinkler pipe hanger /Clamp UL Listed. Made of Mild steel with elecrtro galvanised. Sizez : 1" to 8"
We have carved a niche amongst the most trusted names in this business, engaged in offering comprehensive range of Sprinkler Clamp. Pearson Drums & Barrels Pvt. Ltd.
- Size: 0.5" To 8"
Its used in for holdings pipes etc.